Vanguard thinks I have a wash sale. Do I? 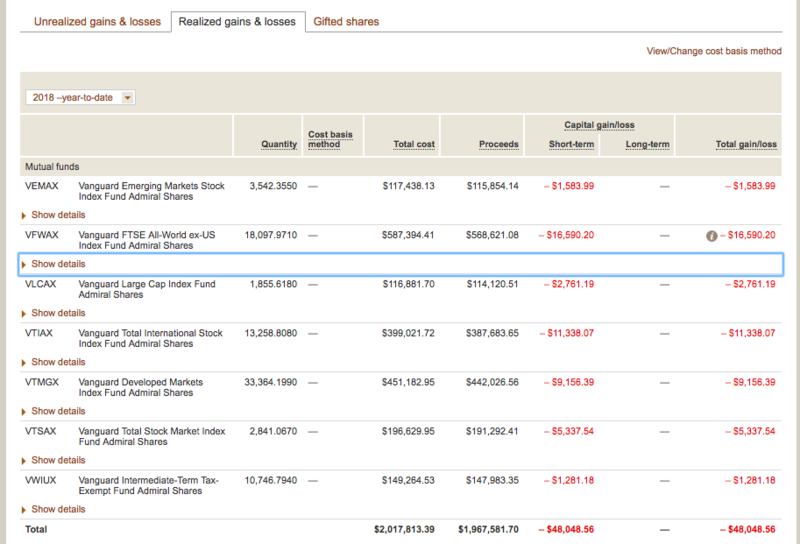 I'm confused by an annotation that Vanguard has put on my taxable account. They think I have a wash sale in a recent tax loss harvesting transaction and disallowed the loss. Either they don't understand what a wash sale is or I don't. Can you either confirm that it is their error or point out why I am wrong? Vanguard is convinced that SOME (and only some) of the FTSE shares purchased on 8/20 and sold on 10/9 are wash sales because of the FTSE shares purchased on 9/28 (which were also sold 10/9). Specifically, the shares they do not like are the ones exchanged from TISM and EM to FTSE on 8/20. The ones exchanged from Dev are apparently fine. I don't recall the order I put the transactions in, but perhaps that has something to do with it. I should note that this is purely a theoretical exercise. I have been credited all the losses I deserve, because what was taken back by Vanguard for 10/9 was subsequently harvested without issue on 10/15. But if my understanding of a wash sale is wrong, I'd like to know about it. I'll post some screenshots that may help someone figure out what's going on. And with more detail for the FTSE fund. So whose error is it? Vanguard's or mine? Re: Vanguard thinks I have a wash sale. Do I? I don't see any replacement shares purchased in any 61-day window. I'm guessing it's a computer algorithm that needs some fine-tuning. Your transactions look legit to me -- no wash sale. Looks good. Did something very similar last week and Vanguard didn't show a wash sale as of today. Is it possible you missed a share lot within the wash sale date range? I noticed when you have many lots the sorting ability and short window in the vanguard "select shares" interface is very limited. During the exchange process changing the sort from total loss to date acquired (to make sure I wasn't missing any lots with a gain within the 30 days before) actually caused all lots I had previously selected to uncheck/deselect. Last edited by Rowan Oak on Sun Oct 28, 2018 12:55 pm, edited 4 times in total. Had a similar issue couple weeks ago and the vanguard rep told me he will not discuss the matter further with me as I need to consult a tax professional. I pleaded with him to hear me out but he refused. I said ok, I will do further research and call back. The next morning he called me apologizing and said he wrote up a ticket to have this corrected. Anyway I’m not sure how my story helps you but I guess it’s more of a word of caution that this might take some effort to resolve. This thread is now in the Personal Finance (Not Investing) forum (taxes). I'm not surprised to hear that Vanguard is having problems accurately calculating wash sales since they are also having problems accurately calculating cost basis. Maybe the big IT upgrade next weekend will help? I'd hope auditors and regulators would be all over them to fix inaccurate tax related calculations (if they know about it, and if they read Bogleheads they do!). The problem I see with the 10/9 FTSE sale is that you bought some on 9/28, less than 31 days prior. I'm curious why there are 3 lots shown with the same Date Sold (10/09) and Date Acquired (9/28). I suppose there may have been 3 separate orders by exchanging from different sources. Can that be clarified, thanks? I suspect if there had been only a single lot, then the presentation and wash sale would have been different. Did the disallowed losses on the lots bought on 8/20 get added to the cost basis of the replacement shares bought on 9/28? What you see is all I have. Maybe it's something I should have my Flagship rep look into. Yes, one from TISM, one from DEV, and one from EM. I think you may be right that this is what tripped up the computer algorithm. Right. Bought them on 9/28 and sold them on 10/9. Why is that a wash sale? Not sure exactly where they got added back in, as I subsequently TLHed everything again. At any rate, I've got credit for the losses so I might just not push this if it becomes too big of a hassle. Discussions of somebody's personal buying and selling of investments doesn't go in the "Investing-Help with Personal Investments" subforum any more? I thought "Personal Finance (Not Investing)" was where we put all the "which vacuum should I buy" and "where should I stay when I go to Zion National Park" threads. But I don't really care. I read it all from the main page and I think most others do too so it's all the same to me. 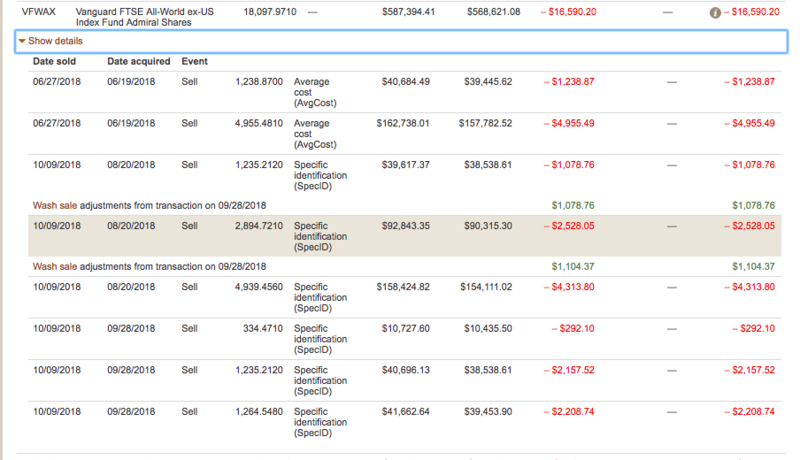 It looks like what happened is that you bought on 8/20, bought on 9/28, sold both, and Vanguard processed the sale as two transactions. If you sold the 8/20 shares while still holding the 9/28 shares, that was a wash sale. And in the eyes of Vanguard's computer, that is what you did, because it processed the 8/20 sale first. It looks like there was no net effect, because your basis on the 9/28 shares was increased for the wash sale, and then when you sold those shares a microsecond later, you got back the disallowed loss. Checking your numbers, I noticed that the basis per share was $32.07 on the first lot, which was unaffected by the wash, and $32.95 on the second and third lots, which were affected. Even if you report the sale on Form 8949, this wash will not appear, because you will report the purchase date as "Various" and the total capital loss is correct. Agreed that it doesn't matter. I just wanted to make sure I wasn't missing something with TLHing because I'm about to do some more this week! I messaged my Flagship guy. We'll see what he does. Maybe, maybe not if you are doing something advanced. I stick with the basic rule: "The wash sale rule prevents you from claiming a loss on a sale of stock if you buy replacement stock within 30 days before or after the sale." I think there is a bigger question here. Let's step back and get some perspective. Why so much hopping around in the first place? Market timing? Trying to tease out differences in various indexes? At first look, it seems like OP is making life needlessly complex. I made a similar set of transactions over the past few weeks. Since 2009, my only opportunity to TLH was in 2016, so whenever one presents itself, I TLH. I sold and bought international twice and harvested $35k in losses. It was not market timing since I immediately bought a similar but different holding to remain in the market. I retired recently and will be living off dividends and share sales, so having some tax loss carry forwards to apply against capital gains is very valuable. The sale of shares bought on 9/28 is not a wash sale. The sale of some of the shares bought on 8/20 look like a wash sale because you bought "substantially identical" replacement shares within 30 days of the sale. While you are talking to your Vanguard rep, ask him why they used the average cost basis method to calculate the cost basis of each lot but labeled them specific identification. With multiple lots I think it’s possible to have it flagged as a wash but to have the extra basis added to other shares you also sold, effectively making it as if nothing happened at all. Maybe that’s the case? I had the same issue, I think this is what most likely happened. Mine was a single share for a <$1 loss so I didn't pay that much attention, but I am struggling to see the basis being added anywhere to the shares it says caused the wash as it doesn't explicitly show that, does it? I sold those a few weeks later. Are you suggesting that buying shares on the first of the month and selling them on the 10th at a loss is a wash sale? Do you really think that's how it is supposed to work? Ha ha. Thanks for your concern. At first look, it DOES appear that way. As you look more closely, however, you'll see there is method to the madness. I'm harvesting losses. Without changing my portfolio/selling low, I've captured nearly $50K in losses already this year which I can use to lower my taxes. Up to $3K of losses per year can be put up against ordinary income and of course they offset any capital gains. Any losses not used this year can be carried forward indefinitely. Can you tell me what you're referring to regarding the average cost basis? Are you talking about the 6/27 transactions? If so, I think I had it set to AvgCost then and later changed it. sounds like you can't do a buy/buy/sell, because one of those buys will trigger the +/- 30 rule. there's only 1 buy within 30 days of your sell, so i don't know how this was a wash sale. I believe Vanguard is technically correct. But you can do a wash sale. And you got the result you wanted. You bought 9069.389 shares on 8/20 and sold them on 10/9. But within 30 days of that sale, on 9/28, you bought 2834.231 "substantially identical" shares. That is criteria number 1 for a wash sale. The paragraph "More or less stock bought than sold" in the linked section applies. It says the replaced shares are the shares you bought first, i.e. the shares bought on 8/20. So you are not allowed to deduct the loss on 2834.231 of the shares bought on 8/20. Instead you add the amount of the disallowed loss to the cost basis of the replacement shares bought on 9/28. This defers recognition of the loss until the sale of the replacement shares. You sold those shares on 10/9 so you can claim the loss this year. Vanguard says the specific identification cost basis method was used for the shares sold on 10/9. But it looks like the average cost method was used, unless I don't understand spec id. You paid 31.99 per share for the shares bought on 8/20. So I think the cost for the lot of 1235.212 shares should be 39,514.43. But Vanguard shows the cost basis as 39,617.37. That is a price of 32.07 per share. Similarly, you paid 32.34 per share for the shares bought on 9/28. The cost for the lot of 334.471 shares should be 10,816.79 not 10,727.60. 10,727.60 would be a price of 32.07. I calculate a total of 11,902.62 shares bought for a total price of 381,788.78; an average price of 32.07. That is why I wonder which cost basis method Vanguard used. Bottom line, though, is that you paid 381,788.78 and sold for 371,392.94, a loss of −10,395.84; the same loss that Vanguard shows. You are very wise. Thanks for your help. I think you've nailed it. I'm curious now to see what the Flagship guy says. By sticking to the basic rule, you avoid a wash sale. "The wash sale rule prevents you from claiming a loss on a sale of stock if you buy replacement stock within 30 days before or after the sale." Different lots but same (or equivalent) security. There are exceptions but then things get complicated. or (else? in addition?) something weird around AvgCost? I have done something similar -- sold a small, within-month lot with a gain (like, say, a reinvested distribution) in the same transaction as an older larger lot with a loss -- and not had a wash sale reported. I thought that was the idea, and how one avoided owning replacement shares, so I'm interested in what happened here. I agree that there is a method here, and I concur with aggressive tax-loss harvesting. However, I have a quick question related to qualified dividends. I did not go back and count how many days you actually held shares that paid dividends but there was quite a bit of trading so perhaps you can clarify. When dividends are paid, most of them are qualified even if they're from international funds. However, the same rules apply: the shares from which the dividends are paid must be held 61 days around the reinvestment date in order to be considered qualified dividends. By holding any of your shares less than 61 days around the dividend dates, did you wind up turning those qualified dividends into non-qualified dividends? So one could avoid the short sale and still end up with non-qualified dividends? That's a great question and an excellent point. I believe you are correct that my 3rd quarter dividends on a substantial amount of stock will now be non-qualified. My holdings on the dividend dates were TISM and FTSE, and none of those shares were held for 60 days. That'll likely cost me $250-300 in taxes. Thanks for pointing that out (no sarcasm intended.) It rarely gets mentioned in tax loss harvesting conversations and honestly wasn't something I was thinking about. Unfortunate. WillRetire, your basic rule can be improved with a more complete understanding of the concept of replacement shares. Replacement shares only exist if you continue to own them. The OP never had replacement shares, because each time he made a sale, he sold all of his holdings. By doing this, and not buying any substantially identical security in the 30 days after the sale, there is never a wash sale. I had a very similar situation with Vanguard. Vanguard says I have a wash sale. When I discussed with my Flagship rep, she got back to me today with the following email. 10/11/2018 for $30.11 per share. Sound like the same thing that WCI had that promoted him to start this post. Uh, what? That defies my understanding of replacement shares. To clarify, do you now hold any FTSE? If so, when was your last recorded purchase of shares you now still hold? To what shares was the adjustment in price made? 3) Vanguard has listed the sale of the 10/8 lot as 2 separate lines (and the same with the 10/8 lot- 2 different sale lines). There is a note on the sale of one of the 10/8 lots that says "Wash sale adjustments from transaction on 10/11/2018"
So this is the same situation as the OP, and is a net break-even. You bought lot A and lot B. Within 30 days after buying lot B, you sold lot A, resulting in a wash sale against part of lot B. You cannot deduct the loss on lot A, but the disallowed loss was added to your basis on an equal number of shares in lot B. Then, a microsecond later, you sold lot B; the disallowed loss on lot A now increased your loss on lot B. Your combined loss on the two lots is correct. A human accountant would say you have no wash sale, because he or she would view the transactions as simultaneous; you didn't hold any shares of lot B at the time you sold lot A, since you sold both in a single transaction. But a computer cannot treat sales of two different lots as a single transaction. If you go down to the first Dec 16 post, you can see that Vanguard indicates a wash sale in the Unrealized gains & losses tab. Further down in the post there is a screenshot of the Realized gains/losses tab, with "Show details" clicked, which shows the details of the wash sale. You can reach these screens in My accounts:Balances and holdings:Cost basis accounting (or from My accounts:Cost Basis). Your final loss should be the same as if there was no wash sale.